On the left is the classic fish taco from Tacofino, on the right, their halibut special. Both are as good to eat as they look in this photo. Both are pretty minimalist, with the traditional fish taco serving up some lightly fried white fish, some light coleslaw style greens, tomato and a delicious mayo based sauce. 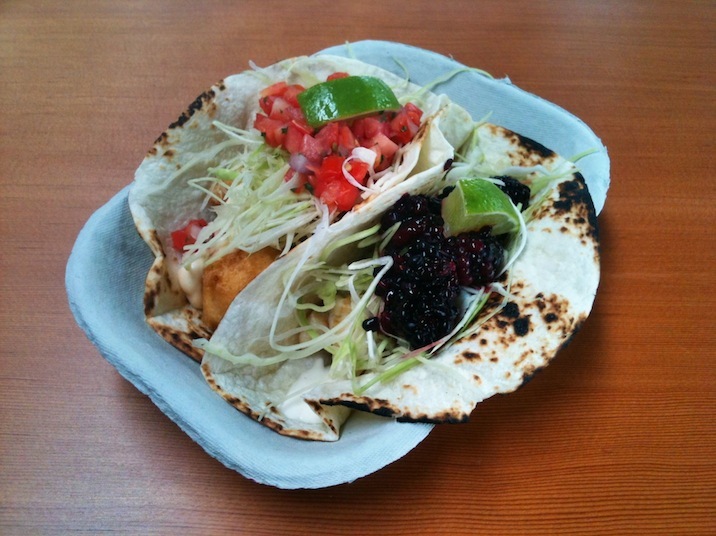 The halibut taco doing a more of a light coleslaw greens with the blackberrys and a lighter sauce. All goodness. Not pictured, but also good are the freshies you can order with them. These are frozen drinks/natural slushie, they do a lemon ginger that is quite good, as well as a lime version. Compliments the food real well. I wish the tacofino link I was sending you too had more than the funky but minimalist webpage they’ve got going on (maybe a menu or something) but you are just going to have to trust me that despite the weak web presence, the food is very much worth checking out. 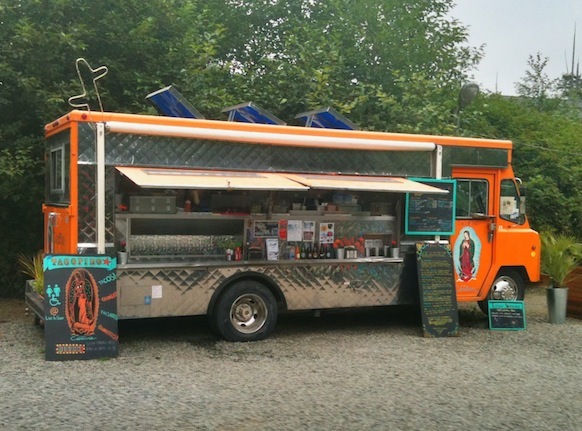 …which comes pretty close to the type of vehicle you want a taco like that to come out of. The good news is that you no longer have to go to the edges of the earth (literally, Tofino is at the very edge of north america) to get this tasty treat. Although I’m getting conflicting reports on their location, they are definitely on the street of Vancouver s well. I’m hearing English Bay (Denman and Davie) in downtown Vancouver, although the good peeps over at Foodology.ca are saying Howe and Robson (although now I understand that this location is serving a Vietnamese-inspired menu). I’m hoping to do a recon mission into English Bay at some point in the near future. Test out the wares and see if they are as good as the original (above pictured) location. Anyways, this is default lunch material when I’m chilling (or engaged in a work vacation) in Tofino, my four square presence is significant. Just wanted to share some of the lighter facts of the Dave Eaves life as we seem to finally have hit summer in the news cycle and life’s got me busy with so many great projects – can’t wait to share more on them later. This entry was posted in cool links on August 16, 2011 by David Eaves. Love that place! Best fish tacos on the west coast!